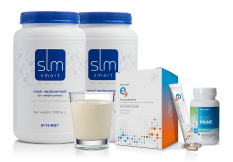 Replace your breakfast or lunch with SLMsmart and supplements for £4.80 per day! One month supply. 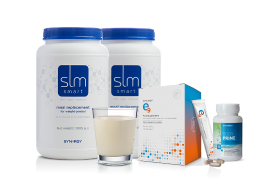 You get 2 tubs of SLMsmart which can reduce your daily caloric intake with SLMsmart’s Meal Replacement shake. The delicious shake plays the star role in the SLMsmart program. This innovative meal substitute supplies your body with the nutrients it needs to operate at its best while supporting your goal to lose kilos. Read more here. You also get Body Prime which effectively prepares your body for any health regimen. With a significant amount of magnesium, it contributes to normal energy metabolism and valuable electrolyte balance. Read more here. You get Synergy’s e9 energy formula which is powered by l-arginine and a blend of Vitamin B12 and B6, riboflavin, thiamin and pantothenic acid, each of which lends to a normal, energy-yielding metabolism. This flavourful mix also contains natural caffeine sources, including guarana seed and yerba mate extract. Every ingredient is safe and of the highest quality, providing you with a low-calorie boost when you need it most. Read more here. Replace either breakfast or lunch with SLMsmart, have two sensible meals a day. It may be worth looking at recipes to suit your blood type, an example can be found here. Take the Body Prime with your first meal of the day and take the e9 mid afternoon to give you a boost.